The Commander line gives you complete flexibility to customize your cooking battery with companion equipment such as Salamander Broilers, Super Charbroilers, and Heavy Duty Fryers. 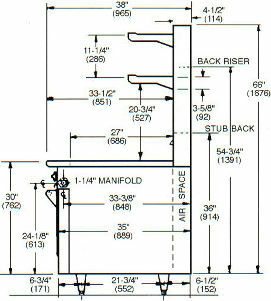 With its all-welded steel frame construction, Commander provides the consistent dimensional integrity for excellent fit and finish—so all individual components in the Commander line match up for easy installation or rearrangement. This rugged construction also gives Commander the strength to withstand years of high-volume use. The Commander Range Line’s extra heavy duty construction stands up to years of high-volume use. Wolf’s exclusive all welded steel frame construction provides exceptional strength and durability. All valves, thermostatic controls and manifolds are positioned outside the heat zone to ensure longer life and more maintenance-free operation. The Commander Heavy Duty Sectional Range Line is ideal for operations that demand extraordinary durability, high performance and easy, trouble-free use. Incredible versatility, too, with a large selection of rangetop and base options. Commander heavy-duty sectional ranges deliver the unmatched durability and reliable performance that keep your kitchen running at its best, year after year. Whether your operation requires a single range or a complete battery of cooking equipment, the Commander line is designed with the versatility to meet the needs of your menu - today and tomorrow - and built to provide long-term, cost-efficient service. Quite simply, it's the strongest restaurant range in the business. And that makes Commander a strong investment in your success. Ahead of the Pack The quality products that give you superior results. Continuing innovation that meets your changing needs for versatile performance and efficient operation. A dedication to customer service that's second to none. 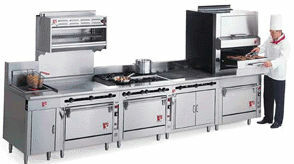 In the vast range of commercial cooking equipment, that's how Wolf Range Company leads the pack. Our product selection is always expanding and improving and our commitment to excellence and innovation is stronger than ever. Wolf is ready to meet your needs today and tomorrow, with the forward-thinking design, advanced engineering and cost-effective performance that help you stay productive, imaginative, competitive. . . the products that keep you ahead of the pack. 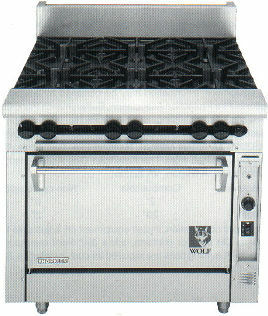 We carry all of Wolf's vast product line including: Commander and Challenger Ranges, Char Broilers, Salamander Broilers, Sectional Bake-N-Roast Ovens, Fryers, Broilers, Cheesemelters, Griddles, Hot Plates, Teppanyaki Grills, and Stock Pot Ranges.